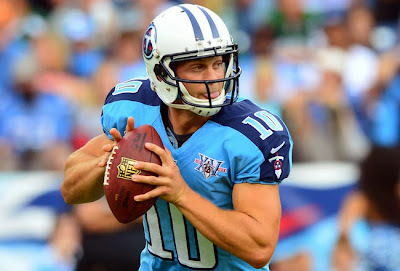 There’s no official diagnosis on Titans quarterback Jake Locker’s right hip yet, but coach Mike Munchak said after Tennessee’s 38-13 win on Sunday that Locker’s hip did not appear to be dislocated. Jim Wyatt of the Tennessean reports that the Titans coach said that the initial look at the injury didn’t show that the hip had popped out. Munchak said Locker went to the hospital for evaluation, specifinot any kind of emergency surgery after being carted off the field in the third quarter. The Titans have further clarified that it was for an MRI. Locker was hit by Jets defensive end Muhammad Wilkerson and then banged into defensive end Quinton Coples as he twisted awkwardly to the turf. “He was upset. It’s emotional,” Munchak said when asked about the quarterback’s condition after the injury. Updates should come at some point in the next day or two, but it still looks like a good bet that Ryan Fitzpatrick will be trying to lead the Titans to a 4-1 record next weekend.